Gah, I love it. The Lils Shotgun Cottage is just 188L for the duration of C88, so be sure to grab it now! From Second Spaces, I have the Amor Couches and Armoires, as well as some homemade Wall Art. Both the couch and the armoire are available in 4 different colors, just 88L each, or you can get a full color pack of each for just 188L. The wall art comes with three different art options, and you get the whole set for 88L. Get it all at Collabor88 from now until March 6! I feel like if I lived here, small woodland creatures would help me dress every morning. That would probably leave more time for breakfast, really, and that can't be bad. See, told you there would be more. I had a lot more fun decorating this tiny little tower house than I expected to. It's the broch tuarach from Tegan Serin and floorplan. and it's available right now at TLC's The Garden. Isla Gealach of Cheeky Pea has an adorably precious new set out at this month's FaMESHed -- the Salcombe Gazebo. With longing thoughts of spring, the gazebo is gorgeously constructed with lovely lattice walls and a semi-transparent roof to let the sunshine filter through on those gorgeous spring days that MUST be just around the corner. Right? Please? Find lots of great things to go with the set at The Arcade [SLurl]! We love mixing and matching! The January round of Collabor88 is ending soon, so let me slide in under the wire to show you the latest amazing house from Cory Edo and Trompe Loeil: the Sparrow Hill Lodge. I may have said this on the blog before, but I'mma say it again anyway: I need a full sim where I can just set up all of Cory's houses and decorate them to my heart's content, and then live happily ever after in my own private little housing development. You guys know I usually like to do a bit of "set dressing" when I have a house or skybox to show you - I like to show the possibilities with the space. HOWEVER, with the Ciaran Skybox from Llorisen, I felt like any extra details would detract from the awesomeness of this space. I SHALL NOT DETRACT. As far as I know, Llorisen is a fairly new shop. Designer Elsa Wellesley has a shop on The Pea with really just a tiny little inventory so far...a few decor items, and this amazing skybox. I really like the layout of the Ciaran, and I lovelovelove the details of the built-in window seat and the rug on the steps. Gorgeous. What blows me away the most, though, is the perfect light and shadow that Elsa achieved in her textures. 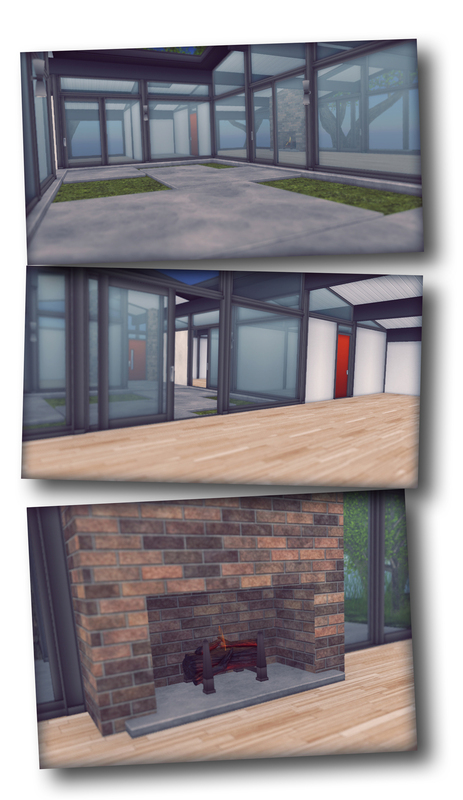 To be clear, I am NOT using any sort of SL shadows in these pics. 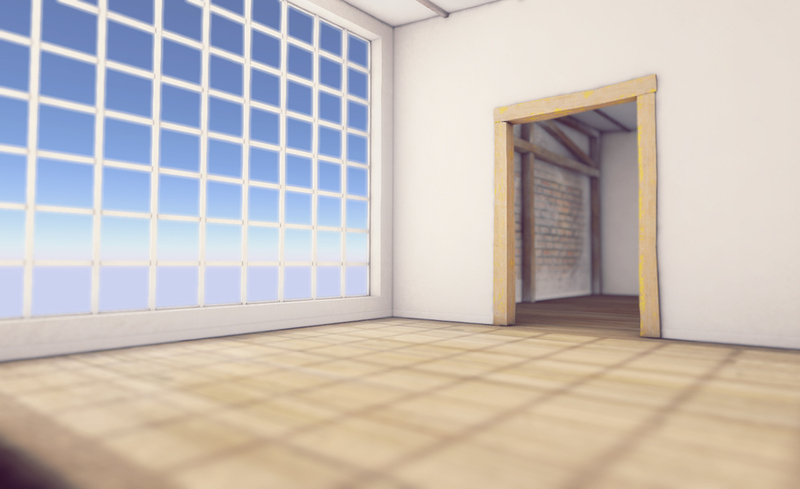 I'm using my standard windlight, which is the Avatar Opt2 Whiter (or something like that), which is like total full bright, no shadows anywhere. (This is why I want all the things to have shading baked in.) The only tool I used when I took these pics was the SL depth of field function. Everything else is exactly what you see here. Know how sometimes designers will show pictures of their items as renders from Maya or Blender, etc? And they look amazing, but then not always exactly as amazing once you see them in SL? This skybox looks like a render come to life in SL. Says me. The house comes with a HUD to change the textures on the rug and on the window seat cushions. It also lets you turn on/off the patches of sunlight on the floor, like in that last picture. This space has so much room for lots of creative decorating, without feeling overwhelming or cold. I may decorate it just for fun for my own enjoyment, and that NEVER happens. My hope is that this is just the first of many skyboxes, and (more) hopefully full houses, that we'll see from Llorisen. Fingers crossed! warmth in the midst of winter. I'm so excited to see a new house from the creative team at NOTsoBAD!!! Designers Reda Bertolucci and Emilie Freund have recently released the ROKEYA house, a gorgeous mesh piece that has a lovely, warm, almost southwestern feel to it. The ROKEYA has a simple one-room open layout, with plenty of space for decorating. I love the exposed brick texture on that one wall, and I am always a fan of beams and columns. I do have SL shadows turned on in the very first pic of this post, but NOT in the 3 pics just above this paragraph. I wanted to be sure you could see the amazing light and shadow that's baked right into the mesh. Gorgeous. The house above is the Neva Captain House, available right now at Collabor88. Great textures, as mentioned, and a fun layout. It's kind of a split-level feel, with cozy spaces for living, dining, office, and even bathroom - there's a lovely sunken tub built right in. I love all the curves in this build, too - the roof line and the arch, with those lovely oversized windows, are all very pleasing to the eye. It is a new month, but thankfully The Garden is still on until the 10th! That gives you a little over a week to fulfill all your lodge-y needs. Those chairs are also available at The Garden from Wavie Haller and Consignment - it's a great adirondack-style chair with a fun and unexpected twist of using the recycled boards for the back (skis? snowboards? no idea, but they're cute). That bathtub is also also available at The Garden, offered by River Stromfield and 11th Hour. I love that all these pieces from different designers work together so well! Yay for themes! Yay for great designers! Yay for bears! There's a new house available at reBourne - the Geneve. I was invited to a sneak preview so I was able to snap a few pics. Like all the houses from designer Danny Bourne, the Geneve has gorgeous textures and amazing shadow and light. (SL shadows are NOT turned on for any of these pics.) It's a smaller house, which really keeps it feeling cozier than a lot of modern-style houses do. The use of so much wood texturing lends a lot of warmth to it, as well. 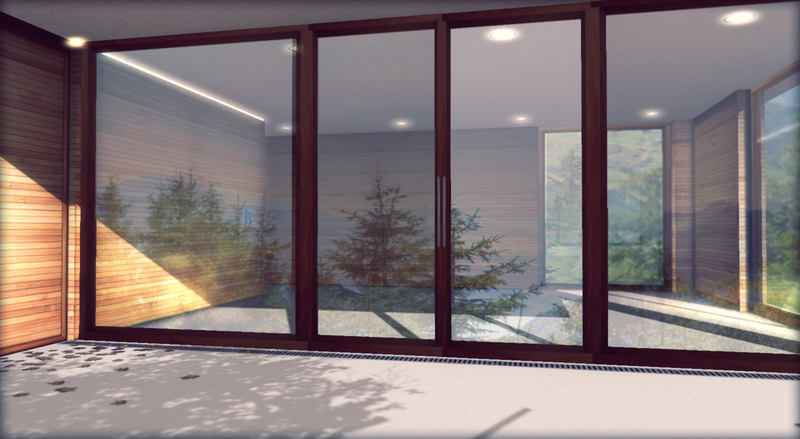 I also love the added detail of the trees "reflected" in the windows. That's a very subtle touch that's really very pleasing to the eye. If you look closely at all the windows, you'll see that there are subtle reflections everywhere - from the inside, you can see the interior reflected. That's serious attention to the detail. Also, is it me, or does that shower wall look totally realistic? It's a gorgeous shower anyway, but that stone wall is just amazing. By Dorian is a fairly-new-to-me shop by designer Dorian Meredith. Dorian was kind enough to send me a review folder to check out, and I was really excited with what I found! She sent along her latest house (at least it was her latest at the time she sent it to me, but you guys know how slow I am) - the Log Cabin. As log cabins go, it's pretty straight-forward and simple, in a really good way. It's mesh and it's textured very well, and most exciting for me is that it's got just the right amount of shading and depth. I am SO picky about that, and this cabin did not disappoint! The Log Cabin comes with or without a built-in kitchen, which is a great option to have. The kitchen that is included is pretty cute, though - so if you're looking for an easy setup, go with that option! It's hard to see, I realize, but there is a split rail fence in that first pic, and that's also from By Dorian. So far, she's only got a few houses available but they're all cute, cozy, and well-done. She's also got a really cute covered bridge available in several colors that would be a perfect landscape accessory. You really need to go check out By Dorian. You. Yes, you. There are still a few days left in this month's round of Collabor88! DON'T MISS IT. 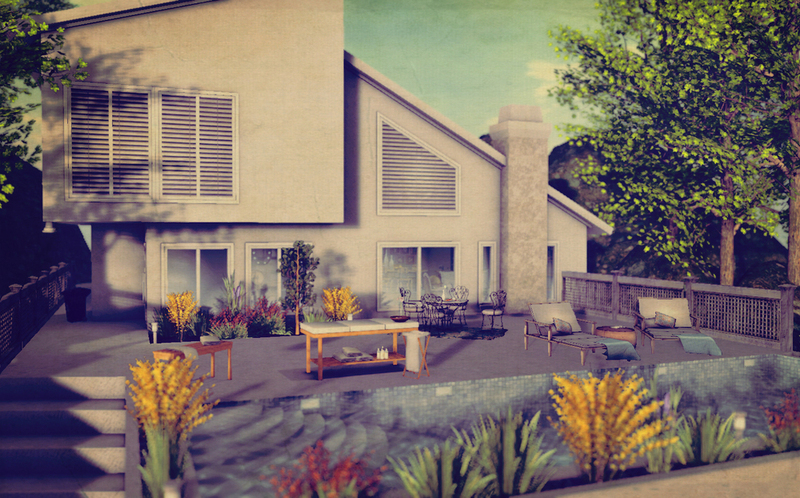 This lovely modern house is the Modern Villa from Cory Edo and Trompe Loeil, and is available at Collabor88 right now. RIGHT NOW. It's another amazing mesh piece from Cory - great shapes, perfect shading, and lots of space without feeling cavernous. While my house preference is always cottage, I do enjoy a well-done modern build, and the floorplan that Cory has laid out in this house is really fun. Outside, the large patio and gorgeously landscaped pool feel quite glamorous! (All the plants around the pool and against the front windows are included with the house. Easy!) This is a must-see!! close encounters of the grill kind. We’re about halfway through this round of TLC’s The Garden and its Area 51 theme. There is so much spacey goodness that you need to check out – truly, all the designs are out of this world (because aliens)! In the picture, we’ve got the Roswell Caravan from Isla Gealach and Cheeky Pea, and the UFO from Tya Fallingbridgeand Pixel Mode. That caravan is just perfect — all the little cabinets inside and a messy little sleeping bunk – exactly what you need for your next UFO-tracking excursion. The UFO is actually meant to be attached and worn so that you can go floating around in your own little UFO, which is the height of preciousness. It’s pretty heavy in land impact, so you may not want to rez it, like, forever…but hell, what do I know about what you want to do? YOU DO WHAT YOU WANT.